We lucked out with our dinner at The Pub Waterfront Restaurant recently--it was pouring rain when we went there. This is a large place with lots of indoor seating and a bar/food area outside, right on the water, mainland side. There are also boat slips. Had it not been raining cats and dogs when we stopped in, I'll bet this is a crowded and busy place, they certainly had lots of staff around. As a matter of fact, our server, James, mentioned that we were his only table, and we did have excellent service from him. We got to sit by the windows right on the water and watch the rain come down. It was really a very serene setting. We ordered the Smoked Fish Spread for an appetizer and it arrived rather quickly. At first I was a bit put off by the packaged crackers, but as I thought about it more, it really fit in with the ambience of the place--a just off the beach pub/supper club type of place in a beach town on the Gulf of Mexico. 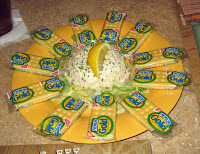 And while nothing extraordinary, the smoked fish dip was very good and had a nice flavor--it must have, we devoured the whole thing. I had a side salad with my meal and my friend Tommy had the Fish Chowder. Both were good though neither was remarkable, just good food. 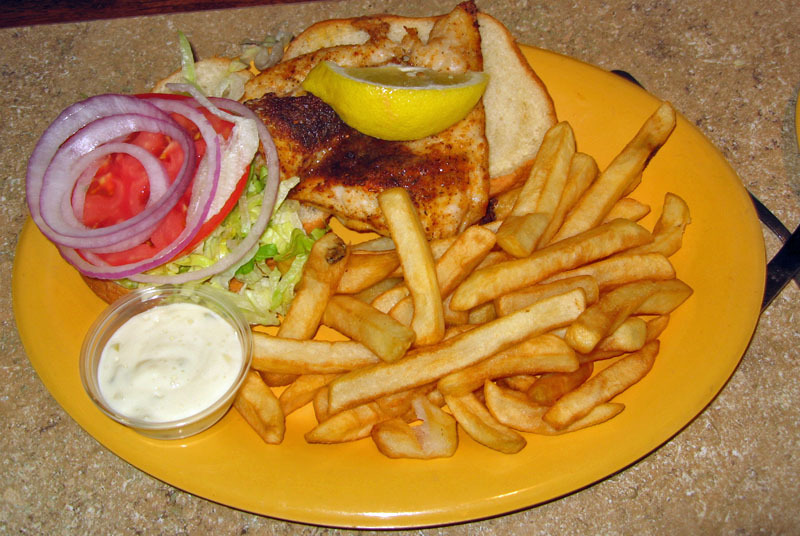 For his main course, Tommy had the Grouper Sandwich, blackened. It was served with lettuce, tomato, and red onions with tarta sauce on the side and french fries. The fries, first of all, were hot and good, properly cooked. The fish, however, was very good. It would have been good all by itself, not even on a sandwich. This was a very good sandwich, we both agreed. 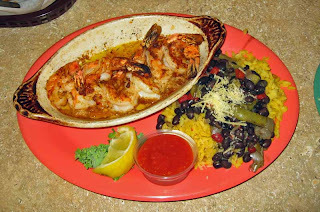 For my entree I had the Jumbo Shrimp Sunset Special. I ordered them blackened and they were served piping hot--very hot. I was surprise to find them cooked well and not overcooked, though I knew enough to eat them quickly before they did overcook. They were nicely butterflied and blackened and swimming in butter--how good was that? They were delicious, no doubt. For a side I had beans and rice. It was OK, nothing too special, but still tasty and it seemed wise to balance the shrimp with some more protein (beans) and some carbs (rice). Over all we had a very nice meal here. Oh, and by the way, by the time we were done, the rain had stopped, the skies were clear, and we were ready to hit the road again, a very successful and wise stop! I'd eat here again, for sure. I think the packaged crackers would have thrown me off too. But hey at least you know they are sanitary!